22 | TH E M R EP O RT FEATURE closing costs are too substantial," said Ray Brousseau, EVP of Carrington Mortgage Services, to the Washington Post. "They don't realize that there are programs for them that allow for a limited down payment and eliminate other out-of-pocket expenses, including closing costs." Mortgage brokers know what mortgage applicants do not. 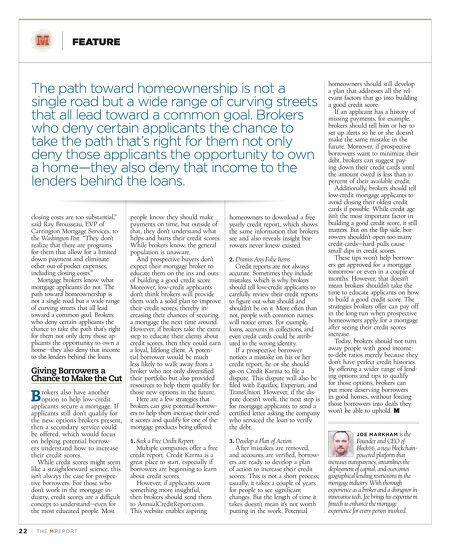 The path toward homeownership is not a single road but a wide range of curving streets that all lead toward a common goal. Brokers who deny certain applicants the chance to take the path that's right for them not only deny those ap- plicants the opportunity to own a home—they also deny that income to the lenders behind the loans. Giving Borrowers a Chance to Make the Cut B rokers also have another option to help low-credit applicants secure a mortgage. If applicants still don't qualify for the new options brokers present, then a secondary service could be offered, which would focus on helping potential borrow- ers understand how to increase their credit scores. While credit scores might seem like a straightforward science, this isn't always the case for prospec- tive borrowers. For those who don't work in the mortgage in- dustry, credit scores are a difficult concept to understand—even for the most educated people. Most people know they should make payments on time, but outside of that, they don't understand what helps and hurts their credit scores. While brokers know, the general population is unaware. And prospective buyers don't expect their mortgage broker to educate them on the ins and outs of building a good credit score. Moreover, low-credit applicants don't think brokers will provide them with a solid plan to improve their credit scores, thereby in- creasing their chances of securing a mortgage the next time around. However, if brokers take the extra step to educate their clients about credit scores, then they could earn a loyal, lifelong client. A poten- tial borrower would be much less likely to walk away from a broker who not only diversified their portfolio but also provided resources to help them qualify for those new options in the future. Here are a few strategies that brokers can give potential borrow- ers to help them increase their cred- it scores and qualify for one of the mortgage products being offered: 1. Seek a Free Credit Report. Multiple companies offer a free credit report. Credit Karma is a great place to start, especially if borrowers are beginning to learn about credit scores. However, if applicants want something more insightful, then brokers should send them to AnnualCreditReport.com. This website enables aspiring homeowners to download a free yearly credit report, which shows the same information that brokers see and also reveals insight bor- rowers never knew existed. 2. Dismiss Any False Items. Credit reports are not always accurate. Sometimes they include mistakes, which is why brokers should tell low-credit applicants to carefully review their credit reports to figure out what should and shouldn't be on it. More often than not, people with common names will notice errors. For example, loans, accounts in collections, and even credit cards could be attrib- uted to the wrong identity. If a prospective borrower notices a mistake on his or her credit report, he or she should go on Credit Karma to file a dispute. This dispute will also be filed with Equifax, Experian, and TransUnion. However, if the dis- pute doesn't work, the next step is for mortgage applicants to send a certified letter asking the company who serviced the loan to verify the debt. 3. Develop a Plan of Action. After mistakes are removed, and accounts are verified, borrow- ers are ready to develop a plan of action to increase their credit scores. This is not a short process; usually, it takes a couple of years for people to see significant changes. But the length of time it takes doesn't mean it's not worth putting in the work. Potential homeowners should still develop a plan that addresses all the rel- evant factors that go into building a good credit score. If an applicant has a history of missing payments, for example, brokers should tell him or her to set up alerts so he or she doesn't make the same mistake in the future. Moreover, if prospective borrowers want to minimize their debt, brokers can suggest pay- ing down their credit cards until the amount owed is less than 10 percent of their available credit. Additionally, brokers should tell low-credit mortgage applicants to avoid closing their oldest credit cards if possible. While credit age isn't the most important factor in building a good credit score, it still matters. But on the flip side, bor- rowers shouldn't open too many credit cards—hard pulls cause small dips in credit scores. These tips won't help borrow- ers get approved for a mortgage tomorrow or even in a couple of months. However, that doesn't mean brokers shouldn't take the time to educate applicants on how to build a good credit score. The strategies brokers offer can pay off in the long run when prospective homeowners apply for a mortgage after seeing their credit scores increase. Today, brokers should not turn away people with good income- to-debt ratios merely because they don't have perfect credit histories. By offering a wider range of lend- ing options and tips to qualify for those options, brokers can put more deserving borrowers in good homes, without forcing those borrowers into deals they won't be able to uphold. 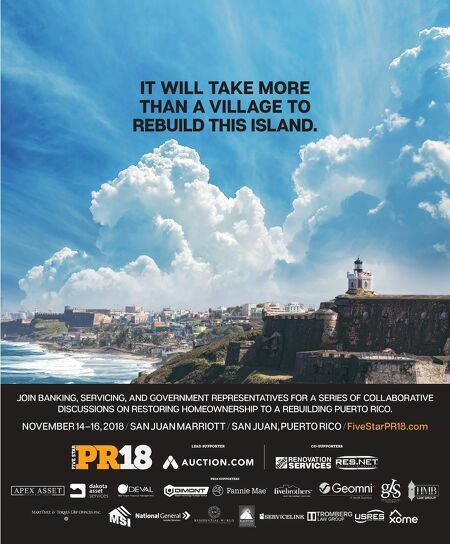 JOE MARKHAM is the Founder and CEO of Block66, a new blockchain- powered platform that increases transparency, streamlines the deployment of capital, and overcomes geographical lending restrictions in the mortgage industry. With thorough experience as a broker and a disruptor in innovative tech, Joe brings his expertise in fintech to enhance the mortgage experience for every person involved. The path toward homeownership is not a single road but a wide range of curving streets that all lead toward a common goal. Brokers who deny certain applicants the chance to take the path that's right for them not only deny those applicants the opportunity to own a home—they also deny that income to the lenders behind the loans.